The ultimate class that gives your mature dancer the experience of a lifetime. This level has been specially designed for our students who have spent their first few years in class with us. We always welcome new comers as well. Our curriculum covers the soft and graceful technique of ballet and the dynamics of jazz. Ballet at this level will encompass all five positions of the feet and arms with the additions of more technical aptitude. Students will focus on developing turn out, fine tuning posture and developing gracefully as dancers. In addition to technique, the student work continuously on flexibility and strength. 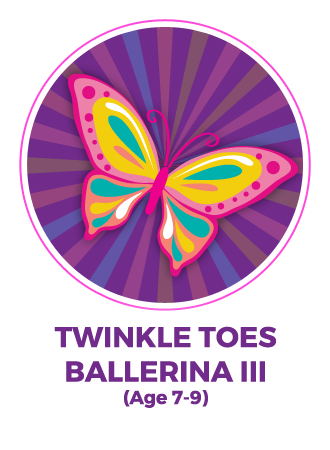 Note: Twinkle Toes II/III classes are combined. New Promotion-Enrollment fee is $150 and includes ($50 registration fee waived), $70.00 monthly program fee(1st month), $80 dance attire fee(leotard/tights/slippers/jazz shoes).